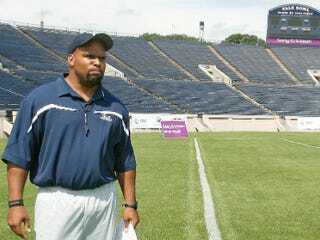 Tom Williams must be a pretty smart guy, having climbed the ranks to become Yale's first black football coach and the Ivy League's second. According to the school's website, he graduated from Stanford with honors and later earned a master's degree there. But the bio also says he was a "Rhodes Scholar candidate," and that line is now under review. The claim, from Williams' résumé, isn't new. But it became newsworthy last week when Yale quarterback Patrick Witt chose to play in "the Game" — Harvard versus Yale — instead of flying to Atlanta for his Rhodes finalist's interview. Numerous news stories referred to Williams as a former Rhodes finalist who skipped his interview to attend a minicamp with the San Francisco 49ers. That led to a New York Times report last week that officials with the Rhodes Scholarship Trust have no record of Williams' applying for the scholarship, let alone having to weigh whether to attend a finalist's interview. Williams told the Times that he applied but withdrew his candidacy soon after and never faced a decision like the one Witt had to make. "I wasn't trying to confuse anyone or make it sound different that it was," he said. "I didn't get as far as he did. I was in the preliminary stages at Stanford and I had to decide, but the interview wasn't official." It would have been nice if he'd corrected the misperception before he was busted. Now Yale has launched an investigation, and Williams has joined an inglorious list of sports figures who couldn't back up their boasts. The Toronto Blue Jays fired manager Tim Johnson in 1999 for lying about serving in Vietnam. George O'Leary resigned five days after being hired as Notre Dame's football coach in 2001, when he admitted to lying about having a master's degree and lettering in football. The O'Leary case led to more scrutiny — and more revelations of falsified backgrounds — throughout the sports landscape. Williams said he never intended to deceive. But it looks like he was OK with anyone getting the wrong impression. He should have been smarter than that.